When you need a digital version of a printed document to store on your computer or to use online, a scanner is what you require. If you have a printed document that you want to keep a copy of in your computer or want to email to your friends, you're going to fall back on a scanner. It makes a digital copy of the document. A scanner shares some things in common with a photocopier. 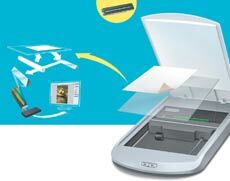 Flatbed scanners are the most commonly used of the four and we'll focus on a flatbed scanner in this How Things Work. A CCD array is the most common technology for image capture and so forms the core component of a scanner. A CCD array is a collection of tiny light-sensitive photosites which convert light into electrical charge. When you scan the document, the light reaches the CCD array through a series of mirrors, filters and lenses. 1. A document is placed on the glass plate of the scanner and the cover lowered. The inside of the cover is flat white and it provides a uniform background. This forms a reference point against which the scanner software determines the size of the document being scanned. 2. There is a lamp below the glass plate that illuminates the document. The lamp can be either a cold cathode fluorescent lamp (CCFL) or a xenon lamp. 3. The scan head comprises mirrors, lens, filter and a CCD array which moves slowly across the document on a belt attached to a stepper motor. It is secured to a stabiliser bar to ensure there is no deviations in the pass (or a complete single scan of the document). 4. The image of the document is reflected on to another mirror by an angled mirror. Each mirror is slightly curved to slightly diminish the image it reflects. The second mirror reflects the image on to a lens, which focuses the image through a filter to the CCD array. 5. The lens splits the image into three smaller version of the original. Each smaller version passes through a colour filter (Red, Green and Blue) in the CCD array to the analog-to-digital converter (ADC). After the pass is completed, the scanner software assembles the filtered images into a single full colour image. 6. The scanned image needs to be transferred to a computer so that it can become usable. USB is the common method. The scanner driver must be installed in computer to be able to read the data.